Though our journeys together over the last twelve months have been to some extent curtailed because of our individual circumstances, me and my cohorts at American Public House Review were at least able to once more gather together at year’s end to celebrate the season with yet another attempt at properly paying homage to Mr. Charles Dickens. The following version of A Christmas Carol was recorded during The Bleecker Street Cafe in the broadcast studios of WDVR-FM in Sergeantsville, New Jersey on December 20, 2013. It is with great pleasure that we share this year’s somewhat faithful adaptation of Mr. Dickens’ finest work. Our lives at American Public House Review and Parting Glass Media reflect the greater human condition. There is ample strife, a bit of hardship, copious challenges; but there are those occasional victories, many reasons to smile, the comfort of kin and comrades–and of course that most precious of all gifts ~ Love! So to all those who like to fill their cup with the milk of human kindness, benevolence and holiday cheer as much as we do, we wish you, your family and friends a Very Joyous and Blessed Christmas–and a Peaceful and Substantial New Year! 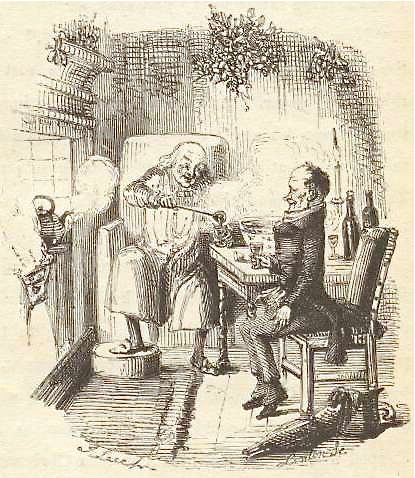 As a special gift to our readers we invite you to enjoy a couple of podcasts concerning our very favorite seasonal tradition, Charles Dickens’s A Christmas Carol. In episode ten of Sit Downs and Sessions we explore our mutual connection to this timeless story of rebirth and reclamation. And in the episode that follows, we replay an actual performance of Dickens’s masterpiece recorded at WDVR-Fm in December of 2010, and featuring The Bleecker street Players (another incarnation of those same rascals that are responsible for the content of our online magazines).